It was going to be a big funeral! John K. was a multimillionaire from old money in Ohio. He parlayed automobile parts industries into mining and resources. He did not attend the church I served. In fact, he and his wife attended no church at the time of his illness. A small group of men in our church welcomed John into their weekly Bible study and loved him. So, when he went into the hospital for the last time, he asked the men if I, as their pastor, would visit him. I visited him and prayed with him in the hospital for about 3 weeks before he died. Not long after the funeral, my secretary buzzed my phone saying “Someone named Al wants to talk with you.” It was Governor Quie with an invitation to join him in his prison ministry in Minnesota. When I walked with Governor Quie through all the security into the big room full of inmates waiting for him, a big man came forward to hug the Governor and I heard “Charlie!” then “Al!” as they embraced. Al Quie is the reason I began going to jail and the one who planted the importance of jail ministry in my life. And it all started when he told me to call him Al. The text for Sunday is John 15:1-17. What does Jesus call us? What do we call him? Can you see the change from last week's altar-piece? The theme last week was Jesus' double command: don't let your heart be troubled, and believe in God and Jesus. The spray of branches looked eloquently like trouble. This week's text is John 14:15-31 with the promised gift of the para-clete also called Advocate or Counselor. This promise is so that we are not left as orphans. 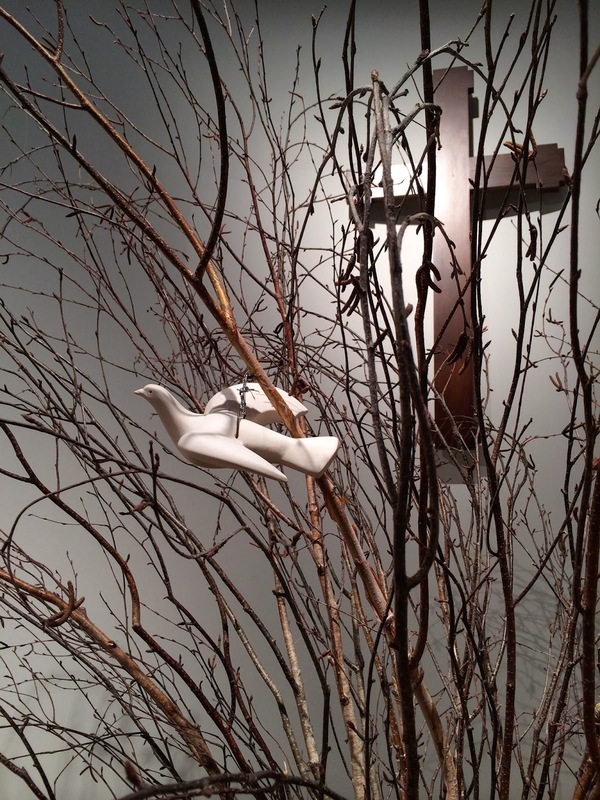 I love how the dove "invades" the branches and brings hope and order to chaos. The text for Sunday is John 14:1-7 which Martin Luther called Jesus' best sermon! I have used it for many funerals over the years or in times of crisis when believers faced uncertainty. But I've never noticed it in context: following Chapter 13 and the dismal response of the disciples (Judas betraying and Peter objecting and boasting). Yikes that's discouraging. Jesus' "A" team does not look so promising. So the words "Do not let your heart be troubled" is an amazing response...or maybe decision on Jesus' part to not let the circumstances divert his heart from where it needed to be. A "troubled heart" is, in many ways, my choice. I choose what to let in or not to my heart. I choose to allow stuff to trouble me or not. The second command is crucial for me: "Believe in God, believe in me." Choosing to not do something rarely lasts for me unless I substitute doing something else, like believing in Jesus.